That's how much GE's aircraft engine unit says it has spent in R&D to produce 3D printed parts that will go into its engines. This isn't just a concept - GE says it is ready to go right now, in what could be a blockbuster development. Although printed parts are already in service on GE's CFM Leap engine in a small way, the first large scale application will be the company's clean-sheet design for its Advanced Turboprop engine, which will power the all-new Cessna Denali aircraft. Additive parts will cut that engines weight by 5%, the company says. GE has also revealed that in a secretive "Skunk Works" style project, it is testing a 35%-additive manufactured demonstrator engine. While there has been much interest in 3D printing for replacement parts, the relative few number of aircraft engines produced could make it effective for the original parts as well. "In engineering we always do a trade between weight, cost and efficiency, but additive manufacturing gives you all three at the same time," GE Additive vice president Mohammed Ehiteshami said. That's the number of years in a new contact between consumer products giant Unilever and Convoy, a Seattle-based startup that aims to become an Uber for trucking. Under the agreement, Convoy will connect Unilever to trucks for tens of thousands of shipments a year and is worth millions, Convoy CEO Dan Lewis said in an interview. It will be Convoy's largest deal to date, though it has other large customers such as Anheuser-Busch, Peterbilt Motors Co. and Scotts Miracle-Gro. The basic idea is that Convoy will match companies needing tractor-trailers with smaller carriers, line up deliveries and track them to better ensure on-time pickup and receipt - though Lewis says the company is fighting the view that "we only mean an ad hoc truck waiting on the side of the road." Convoy is not the only one in this business of course, with Cargomatic, Uber itself and others jumping into the crowded fray. That's how many manufacturing jobs have been lost in the US during recessionary periods since the late 1960s. What is really interesting is that in non-recession times over that same period, US manufacturing has seen a gain of employment of 4 million. The easy math says the overall effect has been a loss of some 6 million factory-related jobs over the past almost 50 years. The key point, says Derek Thompson in The Atlantic magazine this week, is that while for now the incredible advances in robotics have not yet resulted in mass job losses as many have predicted, and indeed US manufacturing employment is up slightly since the end of the Great Recession in 2009, it could be that the impact of technology will not really be felt until the next downturn, which some economists - such as Jason Schenker of Prestige Economics - expect to happen in 2017. "Automation is not a gradually applied force," Thompson writes. "Instead, labor-replacing automation seems to operate like the famous description of bankruptcy - slowly, slowly - and then all at once." Yikes! That was approximately the amazing write-down on the value of its ship assets that Japanese ocean container carrier NYK Line took a couple of weeks ago in the face of the dismay financial situation the industry is facing. 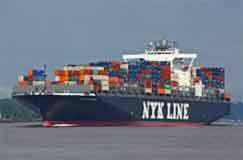 However, that turned out to be right before NYK Line announced a plan to merge with two other Japanese carriers - Mitsui O.S.K. Lines and Kawasaki Kisen Kaisha - fierce rivals that many thought would not join a single alliance (which they did earlier this year) let alone merge. Such is the power of financial turmoil. On the write-down, NYK said that it has "reassessed its outlook for the market from a conservative perspective, and, as a result, deemed it necessary to record an impairment loss as well as a provision for losses related to contracts in connection with its container ships." Not good. All this of course follows the recent bankruptcy of South Korea's Hanjin Shipping Co. NYK may be the first but likely not the only carrier to take such a write down - Alphaliner estimates the top 18 carriers may need to write off some $35 billion of the value of their ships. We hope you've already sold the stock.